Cultural – Historical Foundation “The Link of Times” established in 2004 by the Russian businessman Viktor Vekselberg to repatriate Russian cultural property. The collection of decorative-applied and fine art contains more than 4,000 objects, of which 1,500 are from the House of Fabergé. 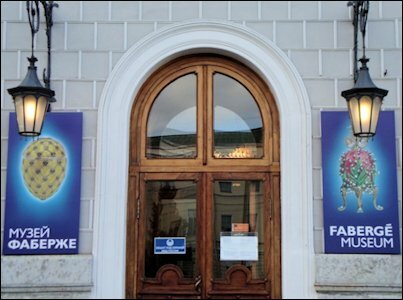 Fabergé Museum in St. Petersburg housed in the Renaissance-revival style Shuvalov Palace with twelve beautifully-restored rooms on the Fontanka River Embankment showcases “The Link of Times” Collection. 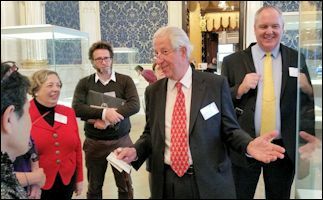 It was the meeting place for Fabergé scholars, researchers, and enthusiasts during two amazing symposium days. 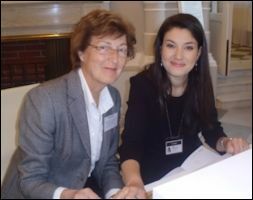 We believe the Symposium has been an extremely helpful and significant event for all of the participants. The Fabergé Museum is proud of the fact that we were the hosts for the Symposium, and we are looking forward to proceeding in our collaboration. You, your friends, and your ideas are always welcome in our museum. Мы считаем, что Симпозиум был не только крайне полезным, но и значимым событием для всех сторон и участников. Команда музея Фаберже гордится тем, что это мероприятие прошло на базе музея, и нацелена на продолжение сотрудничества. Мы всегда рады вам, вашим друзьям и идеям. Allow me this opportunity to thank you for coming to St. Petersburg to take part in our event. 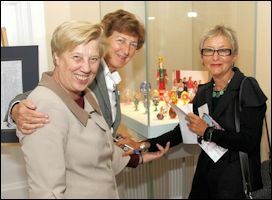 We in Russia were delighted to meet so many individuals who share our interest in the works of Carl Fabergé. 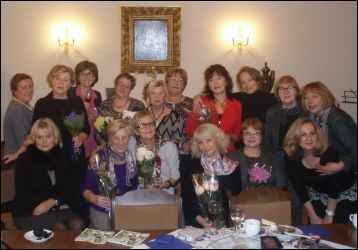 We will never forget how generous every participant was in supporting our charity projects of the Soroptimist International Club. Thanks to your donations, we collected 124,006 rubles equals to $3,100! 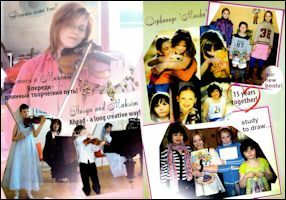 We promise every ruble will bring happy moments and necessary goods to our girls at the Orphanage “Masha”. We thank you from the bottom of our hearts!!! 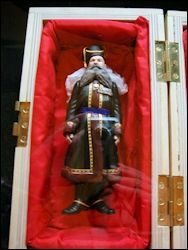 Дорогие друзья и участники Симпозиума по творчеству и истории фирмы Фаберже! Позвольте мне поблагодарить вас за то, что вы приехали в наш город, чтобы принять участие в знаменательном событии. Мы, петербуржцы, были рады встретиться с теми, кто профессионально знает историю фирмы Фаберже и разделяет наш интерес к его работам. Мы никогда не забудем, как щедр был каждый участник симпозиума, поддержав благотворительный проект нашего клуба Международного движения Soroptimist International. Благодаря вашему вкладу мы смогли получить 124006 рублей, что эквивалентно 3100 долларам! Мы обещаем, что каждый рубль доставить счастливые мгновения девочкам из приюта «Маша». Мы благодарим вас от всей души. 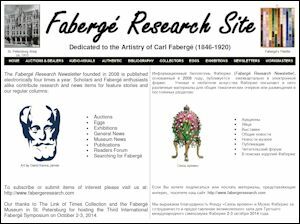 Fabergé Research Newsletter with over 1300 subscribers which allows the dissemination of new discoveries and the exchange of information about the art of Carl Fabergé before 1917. 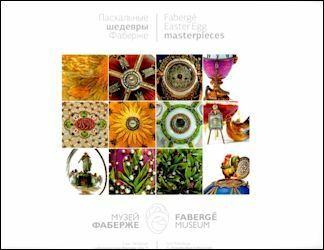 The presentations delivered during the Third International Fabergé Symposium held in St. Petersburg on October 2-3, 2014, have been summarized complete with illustrations through the kind assistance of the symposium speakers. 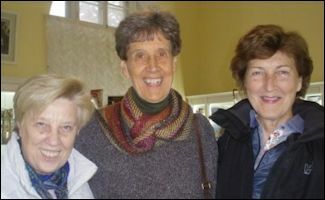 Galina Gabriel and Irina Lynden, members of the Soroptomist International, Neva Chapter, contributed the Russian translations to this edition of the Fabergé Research Newsletter. We extend our thanks to both of them and the presenters for sharing their talents. 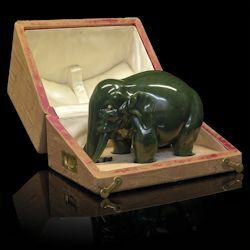 Mark Moehrke liked a Fabergé elephant from the Estate of Prince Henry, Duke of Gloucester, carved out of elephant-gray Kalgan jasper with a castle tower on its saddle. He cited it as an example of combining the two great Royal houses, Russia and Denmark. 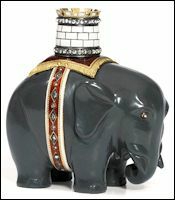 The elephant and tower are the heraldic symbols of the Royal family in Denmark, Empress Maria Feodorovna’s homeland. Géza von Habsburg selected an object he knew well – the 1900 Cockerel Egg – having sold it at auction in 1973 for a then world record price of $207,000 (incredible, with Fabergé eggs now quoted at up to $40 million). 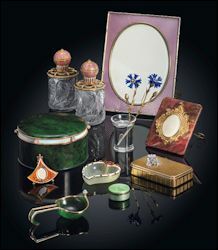 Even though it was not his favorite Fabergé creation, he described it as a fascinating example of Fabergé’s eclecticism, combining a curious medley of styles, including Moorish and French Régence. 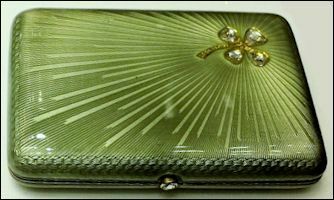 Alexander von Solodkoff selected a green cigarette case with a diamond four-leaf clover he had purchased at a small auction years ago. 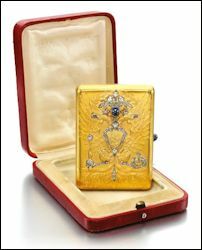 With only a generic description of “Fabergé Cigarette Case” in the catalog he asked to see the piece. Opening the case he discovered an engraved inscription, To dear Nicky from Mama, 6th May 1900. 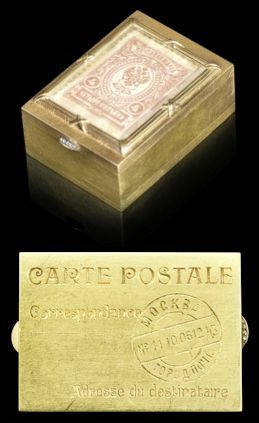 The auction house had neglected to open the case, missed the inscription, which made the case even more valuable. When the time came to bid, he was the only bidder … and acquired an important piece of imperial history. 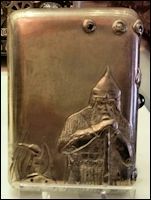 Kieran McCarthy picked out a cigarette case in the Arts & Crafts style with a repoussé and chased image of an old Boyar warrior on the cover, and no enameling. The delicate and understated style and the life-like character of the subject in contemplation was something Kieran found very attractive and touching. Ulla Tillander-Godenhielm chose as her favorite the Nobel necklace/bracelet combination based on the hoarfrost and snowflake designs of Alma Phil, who in her early 20’s worked for Fabergé. Her design talents made a big impression on Emmanuel Nobel, one of Fabergé’s most important clients. As a woman in a male dominated profession, Alma was quite successful, and is known for her other successes, the Winter and the Mosaic Eggs. Our cultural program included tours with outstanding guides to the Hermitage, Pavlovsk Palace, Tsarkoye Selo – Catherine’s Palace with the Amber Room, Jasper Baths, Alexandar Palace – the Anichkov Palace, Stiglitz Museum, von Dervis Mansion, Yussopov and Vladimir’s Palaces, and so much more. Due to an unprecedented endless traffic jam, we had a quick behind-the-scences look of three Fabergé hardstone figures belonging to the Pavlovsk Palace Museum Collection. Learned so much and loved the “behind-the-scenes” opportunities! Thank you for making the seminar a reality and so special! 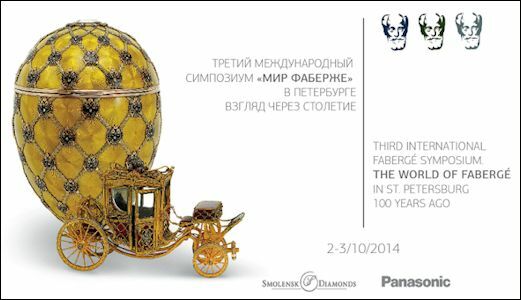 Interesting to see the first documentary movie about Fabergé in Russia. Thank you for all your efforts and enthusiasm to help make the Symposium experience a great success! 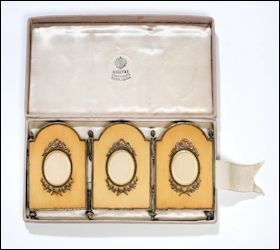 Need out of print Fabergé and Russian Works of Art auction catalogs, books and magazines? New lists just published.